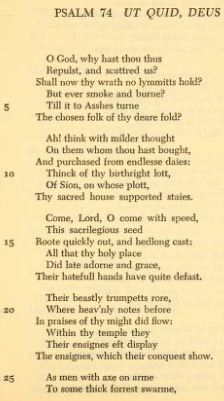 Of all the Sidney Psalms of Sir Philip and of Mary the Countess of Pembroke, one that stands out is Psalm 74. It deserves to be read. It calls for careful study. The entire poem is given below. The chosen folk of thy deare fold? Thy sacred house supported staies. Their hatefull hands have quite defast. Thy hand his help withdrawes? That thy right hand far from us keepes? Which now, embosom’d, idely sleepes. With cursed taunting tongues have torne. The flock of thy afflicted ones. 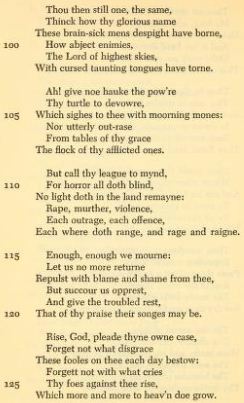 Each where doth range, and rage and raigne. Again, how differently did the men translating for King James think. Here’s the whole Psalm (and below it a link to one place all the Sidney Psalms may be found and read and studied).